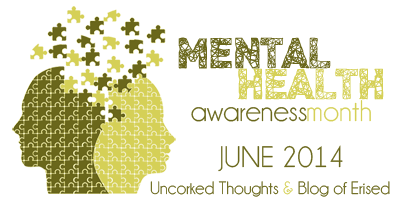 Mental Health Awareness Month is hosted by Leah at Uncorked Thoughts and Ula at Blog of Erised to spread awareness about mental health issues and how they affect people and to encourage book bloggers to read and review books that discuss mental health. ... And I've decided to participate! MHAM runs in June this year. There will be guest posts, interviews, giveaways, challenges, and all sorts of other stuff. I've already got something a little different planned for this blog. Well, if you follow me on Twitter you'll know that I got my boyfriend to agree to doing a joint review with me... or maybe even two! If you're wondering why on earth I decided to do that, it's because I personally don't suffer from any mental health issues, but my boyfriend does, so I thought it would be good to get his view on some of the books I'm going to read. But more on that in June! I'm planning to read at least two books, but hopefully more, and both of these books are currently on their way to me! Amy & Matthew (or Say What You Will as it's known in the US) by Cammie McGovern and Dr Bird's Advice for Sad Poets by Evan Roskos. Anyway, I'm very excited about this event and I hope you guys are too! Thank you for hosting! (: It's a really great idea. I'm looking forward to June!